Rostov-on-Don or simply Rostov (but do not get it mixed up with the other Rostov, a thousand kilometres north) is the gateway to the Northern Caucasus region, the historical hotbed of Cossack culture and peasant uprisings. Nowadays it is southern Russia’s largest and most important port city on the Don. Flowing through the city is the famous Don River, a geographic and cultural landmark. Rostov has seen very few foreign tourists so English may be a challenge at times. Rostov city has an interesting feel - an eclectic mix of old and new. You can find both modern high rises on the river bank and ancient-looking one-storey houses in the centre. Recently, city renovation has been complicated by archeological discoveries and inadequate road routes, causing some discontent. The only mosque in Rostov is located north of the city at Furmanovskaya, 131 after attempts to build a mosque in the city centre were met with protests. The city’s only synagogue known as ‘Soldiers synagogue’ has served the local Jewish community since 1872. It was established by Jewish soldiers and was active after allowing for breaks in 1905 after it was damaged in a pogrom and between 1935-1945. A 10-minute ride to the North-West lies the site of the largest mass murder of Jews during the Holocaust, the Zmievskaya Balka where close to 27,000 mostly Jewish people were massacred within a few days in August 1942. Among those remembered https://www.youtube.com/watch?v=bKHFRtActcQ at the site is Rostov native Sabina Speilrein, one of the first female psychoanalysts and a colleague of Jung and Freud. The city is separated in two parts by the Don river. The left bank features the new Rostov Arena which you can comfortably reach walking over the Voroshilovsky bridge. Apart from the stadium and the brand-new park close by you can also find a vast recreational area on the left bank with restaurants in the forest, beaches and sanatoriums. The right bank of the Don includes all you need for a short visit to get acquainted with Rostov, its peoples and cultures. The Nakhichevan area east of the center is worth exploring, while The FIFA Fan Fest will be located at the beginning of Nakchichevan at Teatralnaya square. Nakhichevan is now the working-class area of Rostov-on-Don; this area is highly recommended to visit as the Armenian churches and old mansions still remain. The Surb-Khach Church or Holy Cross Church is an Armenian church located approximately 20 minutes walk away from the Temple of Alexander Nevsky in Nachichevan district. The church was converted into a museum representing the close ties between Armenia and Russia in 1972, but reopened in 2000 as an Armenian Apostolic church. City life in the summer revolves around two parallel streets – Bolshaya Sadovaya and Pushkinskaya – boasting lots of green spaces, bicycle rental and street musicians. Bolshaya Sadovaya street and the Central Market are also highly-recommended. The recently-pedestrianised Sobornyi pereulok stretching from Gorki park also provides great views of the Christian Orthodox cathedral next to the Central Market. The Central Market at Budenovskiy prospect, 12 is another spot to get acquainted with the city and its food culture. Featuring many treats from the Caucasus and Central Asia, the centerpiece of Rostov food culture is fish and crustaceans from the Don river. If you are in Rostov, you shouldn’t miss ordering one of the most iconic beer snacks – boiled crayfish or ‘raki’ with salt and herbs. You might have to prepare yourself with an instructional Youtube videos on how to eat them – the delicious meat is mostly in the tail. Another traditional beer snack here is dried salty fish or ‘taranka’, salted raw and then sun-dried - a taste you’ll either love or hate. Special mention also goes to the famous fish soup called ‘ukha’. Districts recommended by locals include Zapadnyi (Western), a student area including the Einstein pub frequented by the city’s diverse foreign students. Severnyi (Northern) district is also a safe and popular entertainment spot with a water amusement park H2O and a large ‘Horizont’ shopping mall. Some of the most vibrant clubs and restaurants are located at a former tobacco factory at Gazetnyi pereulok just a few blocks away from the Pushkinskaya street. Nearby, ‘On the rocks’ bar and the ‘Krolik Roger’ restaurant further down Pushkinskaya street are among the locals’ top picks. A stroll along the renovated river promenade at Beregovaya street offers a great vibe with its open-air restaurants and cafes. You can take a short river cruise on the Don, and witness some of the city’s many small monuments. If you have time to discover more of Rostov and its surroundings, such as the Azov sea coast, the ancient Cossack town of Novocherkassk or other sights, we have been recommended a friendly tourist service Lena Tour you can reach at +7(918)571-42-32, also in messenger apps. 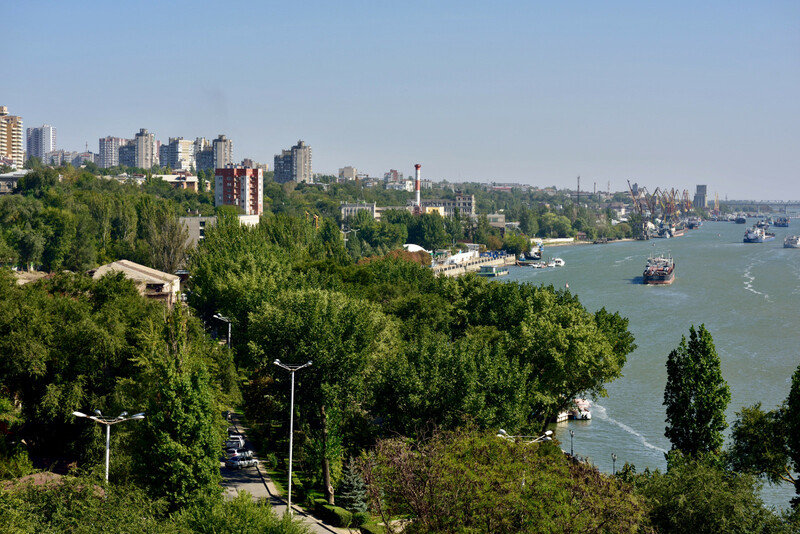 Rostov is generally a safe city except a few areas to avoid such as the quarter behind the Central Market – Turgenevskaya and further down to the river, where street crime has been high in recent years and where some of the city’s shadow establishments are located. One should also be careful around the Gorki park in the summer. The area around the river embankment or Pushkinskaya streets may also pose a danger but this is unlikely during the World Cup. Rostov’s merging of cultures and nationalities can be compared to a grandmother’s quilt because, historically, Armenians, Russians and Ukrainians shared the territory. Currently Armenians represent the largest minority group, followed by Ukrainians, Tatars, Azerbaijanis and even Korean and Vietnamese communities. The city’s universities attract students from across the globe, with many Spanish-speaking Latin Americans from Colombia, Ecuador, Mexico, Peru and Venezuela, as well as African countries. The surrounding villages feature Dagestani, Chechen and Ingush communities among others. There have been some ethnic conflicts in these villages and tensions in Rostov in 2012/ 2013, but since then the situation has improved. Currently the city enjoys a more or less harmonious inter-ethnic climate. Rostov-on-Don is associated with the Cossacks, warriors or literally ‘free people’ who have formed their communities along the Don and Volga rivers, among other places. Some claim that Cossacks are an ethnic group but historically they represented a social group; warriors for hire serving many armies in Europe. Primarily though, the Don Cossacks remained loyal to the Russian tsar, helping to conquer Siberia, repel Napoleon’s invasion and many other heroic undertakings. While Rostov residents are very friendly and hospitable on the whole, the city is still quite conservative and not used to hosting many tourists, thus some might react differently towards people who stand out with their appearance. Local LGBT+ activists advise not to display any rainbow symbols in public and to be very careful with gender non-conforming clothes or public displays of affection. We have warned about unwelcome treatment at the local restaurant chain ‘Ris’ (‘Rice’). Some other bars whose public might not be the most welcoming based on previous experiences of our respondents include ‘Harat’s’ pub and ‘Esenin Pub’. Sports bars like ‘Pinta’ and ‘Cheshka’ should also be visited with caution. Some Cossack groups may display homophobic and violent behavior towards those who violate their idea of public order, due to the special status they enjoy with the government and local law enforcement. Civil society in Rostov is not the most active with some notable exceptions, like the ‘Women of the Don’ union, one of the region’s oldest human rights organisations and a feminist group ‘Fem Izba’ maintaining a shelter for victims of domestic violence. A gender studies club ‘Iva I Yasen’ also organises regular meetings. Rostov’s LGBT+ movement is not very big. Its activities and community events are not announced publicly for security reasons. If you would like to get in touch with the local LGBT+ community please get in touch via info@farenet.org. Activists have noted that before 2013 and ‘anti-gay’ legislation, attitudes towards homosexuality were more liberal. Now any public displays can be problematic. The LGBT+ movement in Rostov takes great inspiration from the neighbouring Krasnodar LGBT+ movement ‘Revers’, officially formed in 2015 by Thor Shirokov, arising from a sports group and branch of the Russian LGBT Sports Federation. Since then Krasnodar has become a central hub of the LGBT+ scene in Southern Russia, providing support and organising joint activities with communities in many cities. The city is historically a large centre for agriculture and machinery and the local team was founded by workers building the ‘Rostselmash’ factory. Renamed FC Rostov in the 1990s, it is still sometimes referred to as ‘Rostselmash’ by fans. The team didn’t win titles during Soviet times but has enjoyed quite a successful run in recent years, reaching the Champions League. In the early 2000s one of Rostov’s fan groups, Wild Legion, was known for its far-right affiliations with one of only two branches of Russia’s international neo-Nazi network Blood&Honour (the other being in Moscow). Things have changed since and you won’t see the same neo-Nazi symbols on Rostov terraces nowadays, but several far-right hooligan groups remain active at FC Rostov.